My 2011 sabbatical continues. In this abbreviated edition of the Gemini Night Sky, I offer the following to keep you looking up and tuned to the wonders above. Saturn is our only evening planet. At magnitude 0.8 it can be seen overhead at nightfall. The Lord of the Rings moves westward all night long until it sets, around 3:30am in the beginning of Gemini and at 2:00am by its end. The planet's yellowish glow is eye-catching above (west of) bluish Spica. As the sky darkens, look overhead for the large triangle formed by Saturn, Spica and golden Arcturus. 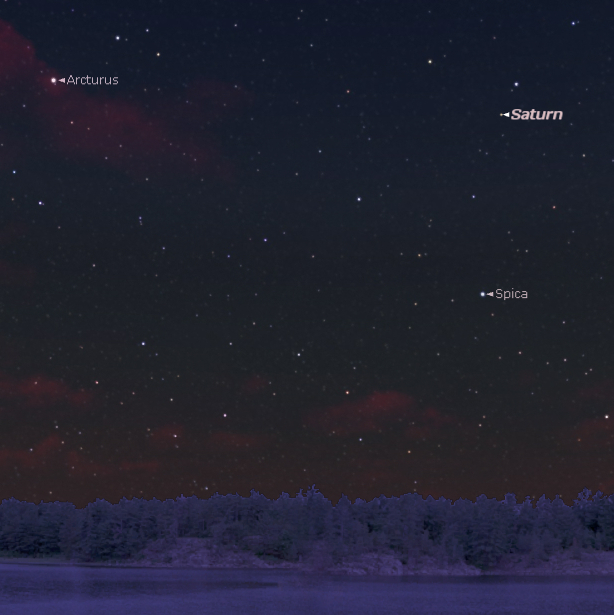 Use the Big Dipper to locate Saturn (see Arcturus below for details). 6/6-11 use the waxing Moon and the 5min.-video by Star Gazer, Let the Moon Lead the Way, to guide you to Regulus of Leo the Lion and to Porrima, Saturn and Spica in the constellation of Virgo the Virgin. 6/9 the waxing Gibbous Moon can be seen near Saturn and 6/10 near Spica. 6/9 Map ~ 6/10 Map Saturn, Spica and the Moon form a straight line the following evening. 6/11 Map/Text Saturn's rings are opening, revealing more and more of their northern face. The planet's ring tilt is 7º in June and widens to 15º by December. Generate images of Saturn's ring tilt as seen from Earth with the Solar System Simulator. With a 6- or 8-inch telescope you just may be able to see Saturn's 5 brightest moons. Mars is easier to see during Gemini, though you may still need binoculars to spot the planet in a twilit sky. Each morning our Red Planet, at magnitude 1.4, can be viewed in a dark sky a little higher above the eastern horizon. Mars rises about 4:45am in the beginning of Gemini and at 4:00am by its end. 5/22-23 use Jupiter to find the pairing of Mars and Venus in dawn's early light. 5/22 Dawn Map/Text ~ 5/23 5:15am Map As Gemini unfolds the distance between ascending Mars and descending Venus increases. 5/30 the waning Crescent Moon positions itself west of (above) Mars. 5/30 5:15am Map Watch the mini-dipper-shaped Pleiades rise to line-up with Mars during Gemini. By mid-June Mars lies south (right) of the Pleiades (M45). Use this 5/31 5:20am Map to see the star cluster's dipper-shape positioned to the right of the Moon and Mercury, preceding its alignment with Mars. Venus at magnitude -3.8 is breathtaking, though low on the eastern horizon. The planet rises around 4:45am during Gemini. 5/22-23 use Jupiter to find the pairing of Venus and Mars in dawn's early light. Venus is 100x brighter than Mars. 5/22 Dawn Map/Text ~ 5/23 5:15am Map As Gemini unfolds the distance between descending Venus and ascending Mars increases. 5/31 the last vestige of the waning Crescent Moon lies to the left of Venus on the horizon. 5/31 Dawn Map/Text Early June Venus lies south (right) of the mini-dipper-shaped Pleiades, the shoulder of Taurus the Bull. Use this 5/31 5:20am Map to see the star cluster's dipper-shape positioned to the right of the Moon and Mercury preceding its line-up with Venus. By the end of Gemini Venus lies to the north (left) of Aldebaran, the eye of Taurus the Bull. Mercury, hidden in the Sun's glaring light, disappears from view during Gemini. The elusive and innermost planet passes behind the Sun in superior conjunction 6/12 at 5:00pm PDT (00:00 UT 6/13). Arcturus is the bright golden star high in the east at sunset. Use the handle of the Big Dipper to arc down to Arcturus from there spike down to blue-white Spica in the south. Helpful Image In 2011 yellowish Saturn lies above (west of) bluish Spica; both are located south of Arcturus. Look for the large triangle formed by these 3 colorful celestial bodies. You can still use this early April Map to see how the triangle relates to blue-white Regulus of Leo the Lion. The westward movement of Arcturus and the Big Dipper can be observed until sunrise. Big Dipper Navigation Notice the seasonal position of the Big Dipper's bowl. Scorpius the cosmic scorpion, a sprawling j-shaped constellation, is seen in the southeast at sunset. It's a summer constellation that's on the rise! Track Bunny's footprints in Scorpius throughout the year. The Summer Triangle is also on the rise! Begin Looking for this stellar right triangle high in the northeast at sunset. Vega is the brightest star and western point; Deneb the dimmest star and eastern point, Altair is the southern point. So Long, Sirius ~ Good-Bye Until August! Sirius, Good-Bye! See you again at the beginning of August. Sirius, the brightest star in the heavens, is sinking very low on the west-southwest horizon as Gemini begins. Sirius reaches its heliacal setting in San Francisco May 23. Sirius our spiritual Sun, which is sometimes referred to as the star of the Christ, disappears into the Suns glowing embrace and is no longer seen soon after the celebration of the Wesak Festival May 17. Its as if the emanations of this star are aligning with our central luminary to flood the solar system with the Christ consciousness during the June 15 Goodwill Festival of Humanity. (see Festival of Goodwill below) The "christening" of humanity is inherent during this cycle with the outpouring and inflowing energies. Heliacal setting times for Sirius vary in different locations and over time. The heliacal setting for Sirius occurs, when the Sun is at the altitude of 0 degrees on the horizon and Sirius is at the altitude of 7 degrees. Sirius at an altitude of less 7 than degrees is hidden from our view by the Suns light. See Heliacal Rising & Setting of Sirius. Curved yellow line across the bottom of the image represents the western horizon. Sirius visibly rises again in the east August 7, 2011. Stay tuned for these details and how Sirius relates to the Dog Days of Summer in a future Night Sky. The Festival of Goodwill, which occurs at the time of the Full Moon on Wednesday, June 15 at 1:14pm PDT (20:14 UT), inaugurates the third of the Three Major Planetary Festivals. The energies released at the Goodwill Festival are forces of the Divine Will that affect the nations of the world. These reconstructive energies can increase the aspect of national life or they can increase the potency of the objectives of world unity, peace and progress. With the keynotes of goodwill and "humanity, aspiring to God," this festival is also observed as the Festival of the Spirit of Humanity, the Christ Festival, the Festival of Unification and World Invocation Day. The Goodwill Festival Links Us to the Heart of our Galaxy! Image: ESO / Stefan Gillessen et al. After 16 years of tracking the motions of 28 stars circling the galactic heart, dedicated European astronomers have gathered the best evidence yet that black holes exist and we have a super massive one at the center of our galaxy. The 1992-2008 European Southern Observatory study used the 3.5 metre New Technology Telescope and the Very Large Telescope - (an array of four 8.2 metre telescopes) for their observations. The NNT and VLT operate from the Atacama desert in Chile. See the ESO Press Release 12/10/08 for additional information. What would our Milky Way Galaxy look like with its bright central bulging heart, if we werent stuck inside and could see through the opaque dust with our normal vision? Nobody knows for sure. Milky Way Illustrated and Barred Spiral Milky Way, however, are two good guesses based on many different types of observations. 6/3/08 findings show two major arms and two minor arms, not 4 major arms. In addition the stars and material of our galaxy, rather than neatly circling the galactic center as previous maps assumed, they are surprisingly tracing an elliptical orbit. A 180-foot poster, the largest picture of the Milky Way was unveiled 6/3/08. See the Poster ~ Read the Description (Btw, the video at this link crashed my internet). Click Moon Dances for a Full Moon map and meditative reflections.